Undoubtedly one of the most suitable designs ever produced in Australia for our tough conditions with a massive 100 square feet of cockpit for the keen fisherman and accommodation for nine for extended family getaways. 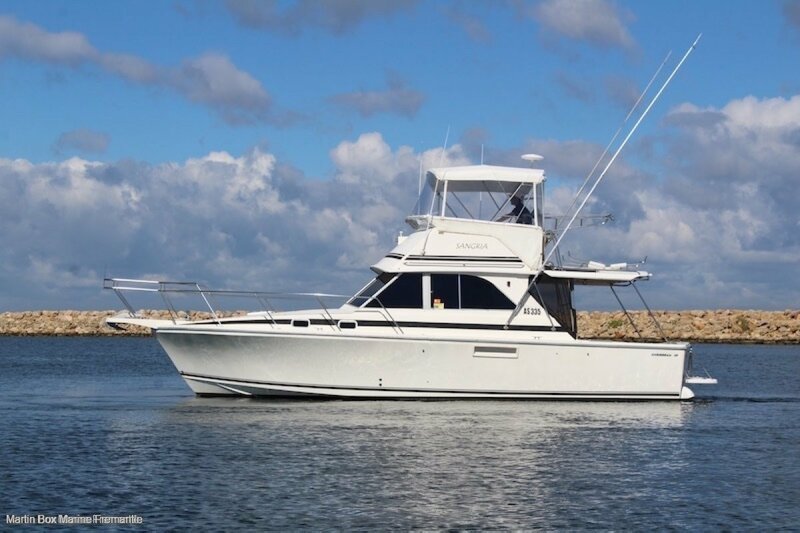 It just doesn't get any simpler or better than a Caribbean 35' and this 1996 model ticks all of the boxes. Extras include a 6.5 Kva Onan generator, factory hardtop Bimini, game poles, tender cradle with davit, transom door and a walk-on cockpit awning. You just wont find better value in this price range and this rare later model with the mezzanine galley is sure to attract immediate attention. (Suits Bertram, Riviera, Blackwatch and Precision buyers). Twin Shaft Drives with keels. Mezzanine U-shaped galley with plenty of storage and bench space. Hard top Bimini with full length cockpit awning with walk-on panels. Dolphin Auto Battery Charger, GME Radio, Furuno GPS and Echo Sounder. You just wont find better value in this price range and this rare later model with the mezzanine galley is well worth inspection.